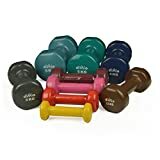 diMio vinyl dumbbells in double pack. 0.5 – 6 kg in trendy colours, handle length: 9.2 cm. Good grip, kind on skin and easy to clean. Vinyl coated metal core (soft grip). For fitness, endurance training and muscle building. The ideal partner for fitness, endurance training or muscle building. The weight is made from a vinyl enclosed steel core. This ensures a relatively heavy weight at a small size. Thanks to the vinyl coating, the dumbbell lies easily and comfortably in your hand and is also easy to clean after use. The flattening of the metal core at the sides is very practical as it stops the dumbbell from rolling away. Depending on the weight selected, the dumbbells come in 9 attractive and trendy colours. The weights of the dumbbells are designed so that training intensity can be done in small steps of 0.5 up to 1 kg. The lighter weight (0.5 up to 1 kg) is good to use for (power) walking or jogging, The larger is commonly used for targeted muscle training. We hope you have lots of fun and success with these weights. It is recommended to order 2 or more sizes to try out your favourite training weight.